One day I was talking to the second grade teacher at our children’s school in Bogota, Colombia, and she told me that in social studies they were studying social norms. In order to teach the children what norms were, she thought she would ask them about the mealtime rules in their home, assuming she would bring to light many norms that they all knew. So she was surprised to find out that among her dozen or so students the only rule they all had in common was: No Singing at the Table. I’m not even sure why that’s so often a rule, or at least something mother’s say when children start singing at the table. I looked it up and couldn’t find an answer. My only guess is that it interrupts conversation or annoys parents. But at our table we do sing. We don’t sing at every meal (nor while we're eating! ), but we always sing during devotions near Christmas and Easter and on other holidays like Thanksgiving and even the Fourth of July. We didn't sing during the meal, but after. In the summer we purposely chose hymns to memorize. 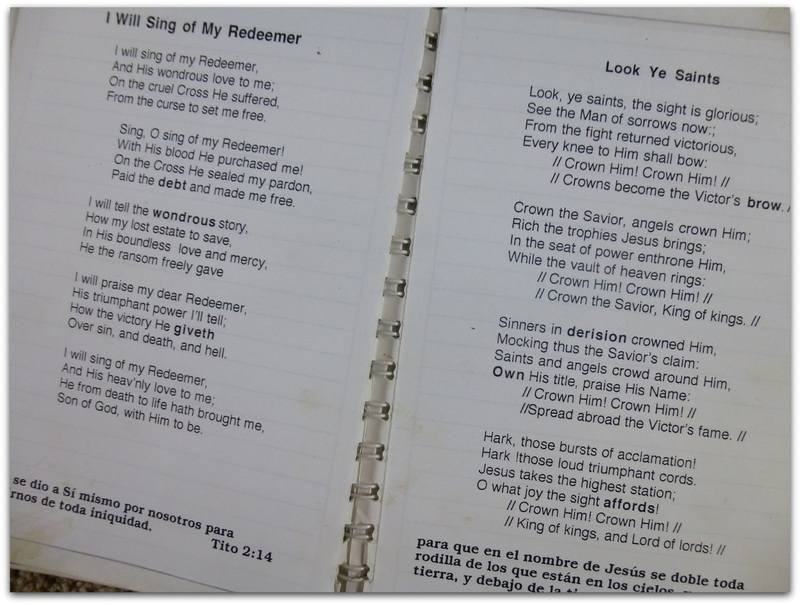 My husband and I picked out about half a dozen hymns we wanted our children to know and I typed or photocopied them and glued the sheets into a notebook. Since the hymns often had words that weren't in our children’s everyday vocabularies, I put those words in bold type and I made a glossary for them to use to learn the meanings. When we sang each hymn--everyday for a week while learning it and then once in a while after that to keep it fresh--we talked about what it meant and how it encouraged us. The year when my husband’s brother was dying of cancer, God led us to several songs that had verses speaking of the end of our journey, God’s faithfulness, and our hope for the future. We sang some of those songs when we had our own private memorial for Pete after he passed away. During that difficult season, hymns were a special comfort to my husband, his parents, and Pete's widow. When we have singing planned as part of the after dinner activities we provide the words to the hymns we'll be singing. In that way our Chinese foreign exchange student and our German future son-in-law have been able to join us. Besides, our singing always sounds much better when others add their voices to ours--especially if those voices are the melodious ones of my parents-in-law and sister-in-law! 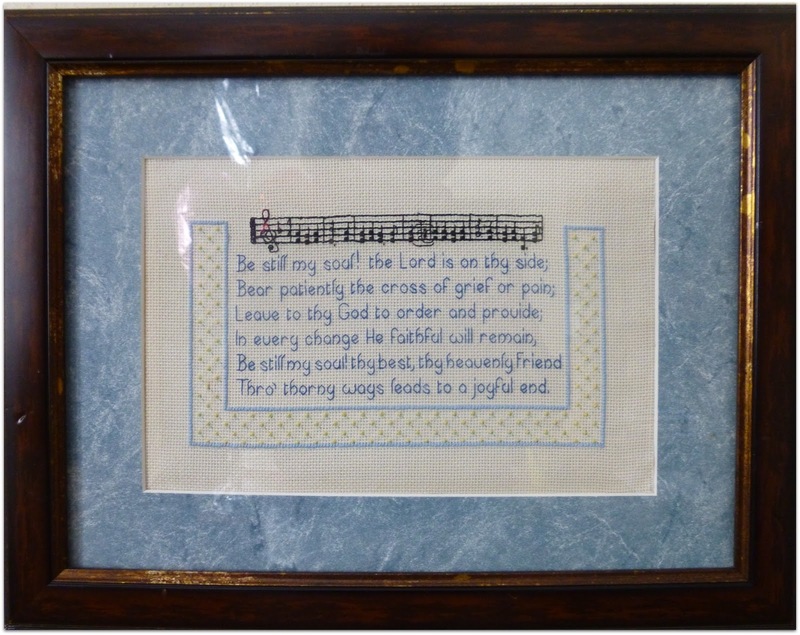 My father's memory is failing, but he too learned many of these hymns as a child and when we sing, he may not remember what holiday it is, but he knows the songs and he knows the One to and of Whom we are singing. That's my prayer for my children, too. I believe these songs will play on their mental playlists all their lives and I pray the Lord brings them to mind when they need them, when they want them, and maybe, most especially when they don’t want them. Connect with your family through singing. Choose songs that are easy to sing without music, or if you are blessed enough to have a musical family, bring the instruments along! Just don't sing with your mouth full. This is an awesome idea, Sharon. 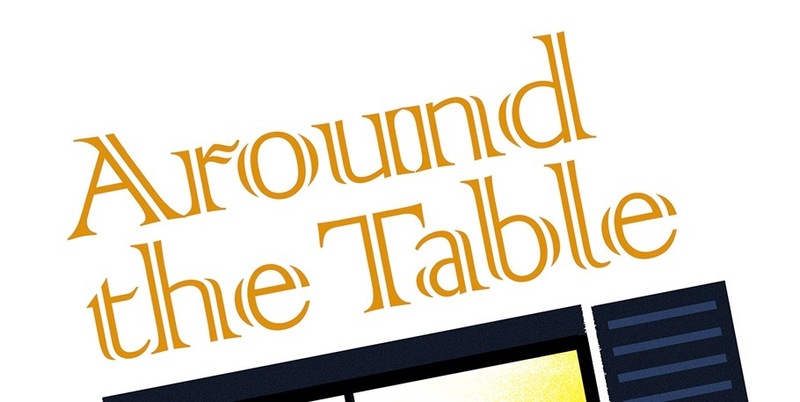 We often sing the Doxology for our grace at the table. Learning the hymns was important for us, too. We liked to teach them the story behind the hymns, too. I'm so glad you did this with your kids too! 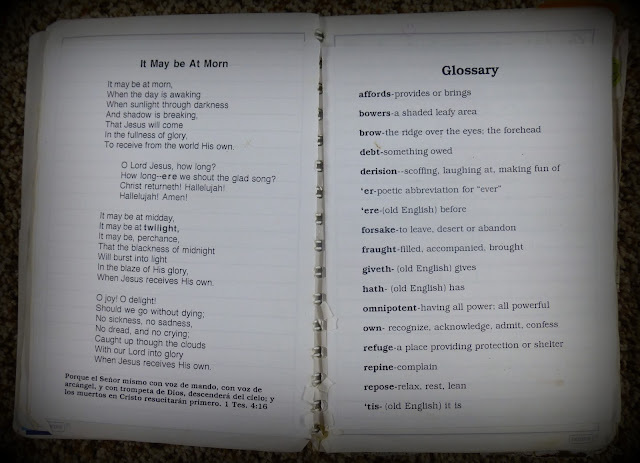 I love this and the idea of the glossary! 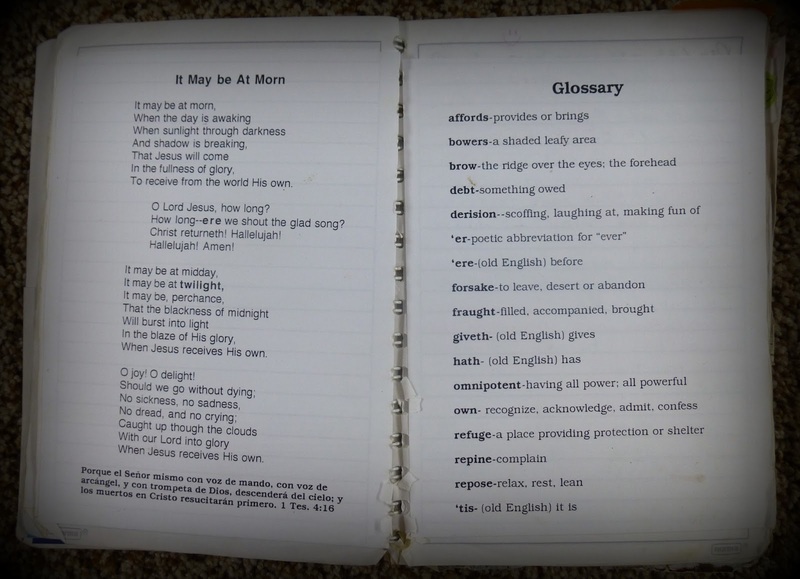 We figured our kids didn't grow up with English "church speak" so we needed to help them. Some of the time it helped me understand! Great idea! I wish we had done this with our children. Memorized hymns can be so comforting. We ALWAYS sing at the table! My husband's mother always said, "If you sing at the table you'll have crazy kids." I have no idea why, because she started this whole lovely mess of singing at the table! We start with our prayer, but inevitably someone will chime in with silly new word to a familiar tune, or two, or twelve. I would be worried if there wasn't singing at our table! I'm sure your kids won't be crazy! Oh how wonderful! I've been singing simple hymns to - and with - my grandkids for years - when giving them baths or driving in the car. I also love to play lovely praise and worship music - new and old hymns - while driving with them. It is, indeed, a wonderful way of leaving a sweet spiritual legacy of God's love in their hearts - as well as hiding God's Word and truths in their hearts, hopefully for a lifetime! It's so great to be able to pass this on to future generations. There are so many things I can relate to here. I did something similar for my children as they were growing up. 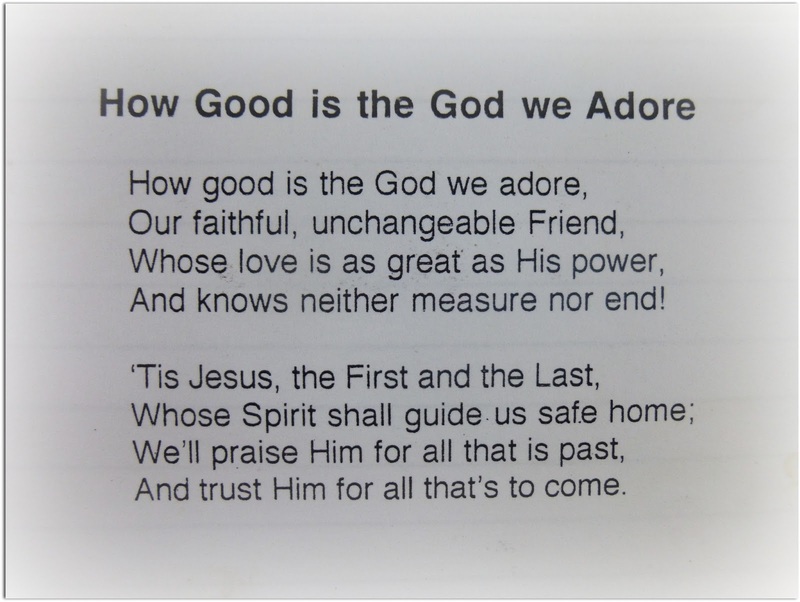 Since we were attending a church where the singing was contemporary, I wanted to my kids to know the old hymns. I cut out pictures to add to the words. I remember a Sunday School teacher I had who had poster size words to hymns and one of them was the It May Be at Morn song. I still have words from hymns come to me randomly, or I recall them to mind when I am trying to get to sleep at night. Thanks for bringing such great memories to mind today. You are so welcome! I like your ideas of pictures, too. We are not a musical family. We joke that the only instrument we play is the radio. But we did grow up singing hymns. My dad lost most of his hearing in WWII, so he always bought cars without a radio. It was just background noise to him. We traveled at least twice a year the 500 miles to visit our grandparents. All the way there and back, the 6 children and my parents would sing hymns that we all knew from the Baptist Hymnal. In addition, my sisters and I sang while we did the dishes every night. Even though I left the Baptist church to become Catholic more than 30 years ago, I still remember all those songs. I often sing them in the shower now. Good memories and good for the soul. Amen and amen!!! Although we didn't sing at the table we sang just about everywhere else. In the car, in bed at night, in the yard ...Perhaps all that singing is what led me to a career as a Music Teacher. I agree with you as to the importance of teaching our children the Hymns of our Faith. You never know what singing with the family can do! I love love hymns! I learned several as a child and they have been a source of comfort and strength all through my life. I want to teach them to my grand kids and had planned too....but somewhere in the business of life I have forgotten about that! thanks for the reminder :) Thanks for linking with me too ! Isn't that so true, that we were always told not to sing at the table?! We always did with our children in the morning after we had a devotional time. Thanks for linking up over at WholeHearted Home. It is so nice to have you! !